Wow, it has been a busy weekend! 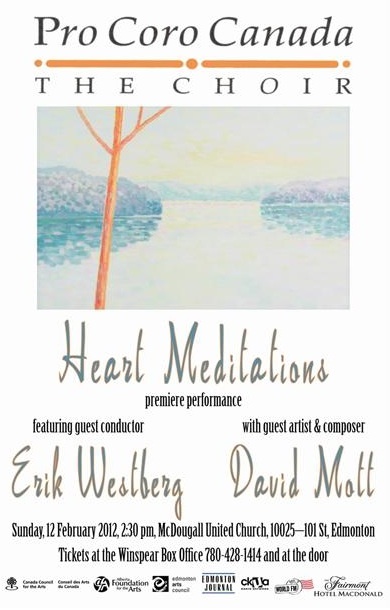 In conjunction with the announcement of the new Pro Coro Artistic Director, Michael Zaugg, the next set of rehearsals have begun with Erik Westberg for the premiere performance for David Mott's "Heart Meditations." 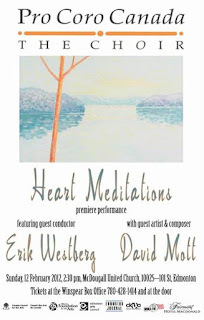 Mott will also be joining Pro Coro on saxophone for the concert. There will be a concert this Sunday, February 12, 2012 in Edmonton (which will be recorded for CBC radio) as well as one in Camrose, Alberta next Wednesday, February 15, 2012. On Friday, I felt a bit mentally displaced since we found out Zaugg was the new artistic director, performed with him, then we went straight into rehearsal with Westberg. Initially, it was difficult for me to understand the "Heart Meditations" work as a whole. The piece consists of 49 verses which are repetitions of the Buddhist Heart Sutra text: "form is emptiness, emptiness is form." I felt like I didn't have much thematic context for the work. The 49 verses began to sound like an amorphous musical entity to me after the first rehearsal. However, I was granted some fresh perspective to consider the piece within the performance space and with the addition of saxophone accompaniment. It's hard to keep the overall musical vision in mind when you're invested in small musical details... like fixing wrong notes. It's so easy to focus on the immediate feelings being generated in a particular moment; it's also a part of the artistic process to be that absorbed before having the luxury to take a step back and evaluate the work. Thus, in keeping an open mind and hearing an enlightening description by Mott, I now have a better understanding of the musical intent of Mott's "Heart Meditations." He explained how the piece was composed in response to the passing of his mother. Each of the verses take on various moods and correspond to the emotional highs and lows of the grief cycle. Of course, there are still many facets of the piece open to musical interpretation, but it was helpful to have some framework to understand the work.